Don’t you just hate poorly cared for nails? This may be a reoccurring problem with your husband or your older children, but it doesn’t have to be for your baby. In fact, it’s essential that you trim your baby’s nails since dirt can get trapped underneath them so easily. These depositories of dirt are notoriously difficult to clean. However, since we all know that our children simply love to put their hands in their mouths, it’s vital that we keep them as trimmed, clean and neat as possible. Don’t worry if the idea of trimming your baby’s nails seems overwhelming. It’s as easy as trimming your own. To get you started, here are three of my favorite baby nail clippers, designed to be as easy to use and hassle-free as possible. Do I Need Baby Clippers? What Should I Look for When Buying Baby Nail Clippers? I’ll start with my all-time favorite clippers that I still use to this day. 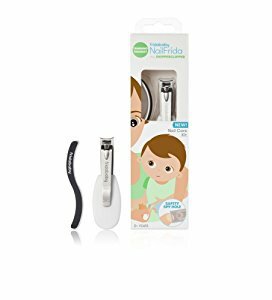 The Piyo Piyo clippers are easily one of the most popular baby-friendly clipper sets available, and for a good reason. These clippers are comfortable, easy to use and come with a protective cover. This ensures that your scissor set can last for many years to come. 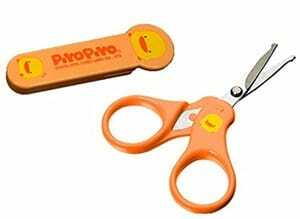 With safety in mind, each potential point of the scissors is rounded. This helps to minimize the risk of injury should you accidentally clip you or your baby. There’s also been extra care taken to balance the handles of these scissors. This is ideal for making them feel comfortable when in use, no matter if you’re left or right handed. What's Great About It: The blades of the scissors are made using high-quality stainless metal materials. Not only does this help the scissors last for many years, it also makes them incredibly easy to clean after every use. As the title suggests, this clipper set is designed to excel in all areas of safety. This is because, instead of scissors, these clippers have an extremely unique design. As you can see, the main body of the clippers is large and rounded. This makes it incredibly easy to get a firm grip on the clippers, minimizing the risk of dropping them. The operating handle itself is small, compact and durable. What's Great About It: Instead of having blade-like scissors, these clippers use the traditional adult-like clipper design. The metal has been curved so you can trim all your baby’s nails in one clean movement. This saves you time, hassle and stress. To conclude my list, I’ve chosen this awesome little set that you’re going to love. This is a unique clipper set as it combines all of the best aspects of scissors and nail clippers into one product. Similar to the clipper above, this set has a large main base into which the clippers are connected. This base is very easy to hold and minimizes the risk of them falling out of your hand. On the top, there’s a rotating handle that allows you to operate the clippers with your thumb. The blades are produced from scissor-like metals. These are both durable and sharp enough to effortlessly cut through your baby’s nails in the most safe and comfortable way possible. All these features combined mean that you can cut your child’s nails with minimal time and effort. What's Great About It: To make things even easier, these clippers come with an exclusive spy hole. This means you can see exactly what you’re doing and where you’re cutting at all times. 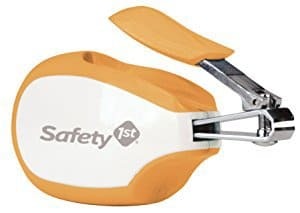 This ensures the maximum level of safety for your baby. With all this in mind, you still may be wondering exactly what makes a good pair of nail clippers. Well, don’t worry; I’ve done all the hard work for you. Here are a few tips to consider while shopping for the ideal pair of clippers. It may seem wasteful to purchase a second pair of clippers. In most cases, you’ve probably got more than one pair lying around your home already. But these are usually far too large to be used on your baby’s delicate nails. The blades, especially the curve, will also be designed with adult fingers in mind, so you won’t get the same effective cut. Baby nail clippers will be specially designed with your baby’s tiny fingers in mind. These are a lot smaller than adult clippers and will be much more effective. You’ll also be able to see what you’re doing a lot easier. A spy hole, although not essential, is a great feature to have on your nail clippers. It will increase your visibility while using the nail clippers so you can be sure you’re getting the cuts in the right places. This also helps to minimize the risk of accidentally clipping your baby. There is a ton of baby nail clippers available. The more expensive they are, the more features they’ll have. You can find clippers with magnifying glasses, LED lights and more. However, not only will these require extra batteries, they will also cost you a lot more money. In most cases, a simple pair of nail clippers will give you everything you need. This is because you’ll be in really close contact with your baby anyway, so it will be easy to see what you’re doing. You can start trimming your baby’s nails from the day they’re born. However, you’ll want to be sure that you have the right tools for the job. Don’t worry if you do clip your baby’s skin from time to time - this is bound to happen and will heal quickly. As with anything in life, practice makes perfect.